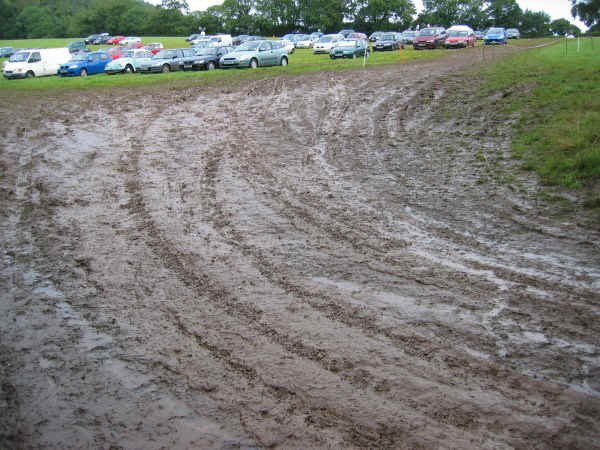 Sidmouth Folk Week 2009: Bulverton car park - not a pretty sight. Must do better next year or maybe just don't bother? then click 'refresh' and the remaining ones should come through. 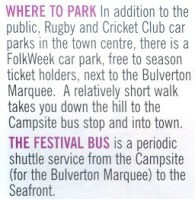 The main festival car park at the Bulverton might be seen (incorrectly?) as essential to the operation of the whole event. It might also be thought to influence the viability of events at the Bulverton marquee: many people might drive but not bother waiting for a bus and trudging up the slippery hillside. However this is unlikely much to influence the finances: many events at Bulverton are included in season tickets and with only dedicated folkies being willing to make the journey, whatever the conditions. Therefore, very little money may be taken on the door in relation to the cost of the venue - and little of this may be influenced by whether there is a car park or not. Numbers actually attending could be far more influenced. The car park does however have other uses. If cars have to be removed from the campsite (or cannot be allowed onto it owing to the ground conditions) they have to be put somewhere. In future years more effort may be needed to prepare this car park for the worst of conditions - even if they are not realised. Alternatively, looked at in cold financial isolation, it might just be scrapped. To comply with H&S concerns, it should also be properly stewarded at all relevant times - a particularly thankless and sometimes arduous task. Large warning notices at the exit "DEAD SLOW OR ELSE..." might be a statement of the obvious, but given that we nowadays have to have notices to warn that rivers contain water and that water can drown people (and that walking over what is obviously a cliff face might be injurious to health), maybe next year? If a disabled person had come to grief (either in a car or outside of it) and if no steward had been on duty, there could have been a case to answer in respect of lack of duty of care? Whatever is in the small print, you cannot (as I understand it) contract out of negligence. 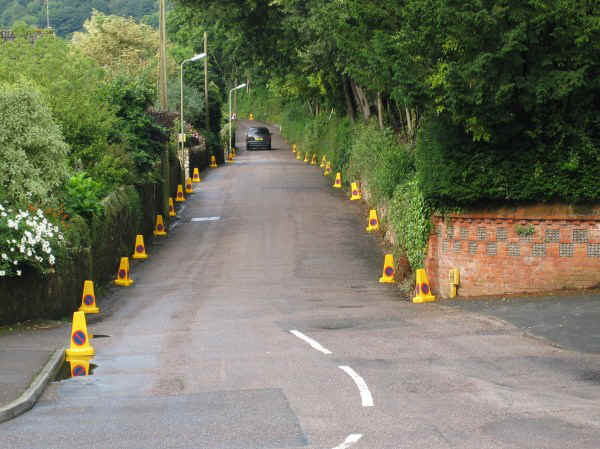 The long road to the Bulverton car park starts innocently enough. Broadway, adjacent to EDDC's offices, and quintessentially a part of old world Sidmouth, is one route to the prestigious St John's School. A little further along it joins Bickwell Valley, home to many of Sidmouth's quiet millionaires and landed councillors. Further to the west still lies the tranquillity of Sidmouth's golf course. Abandon hope all ye who enter here - but once you have arrived, you have little choice in the matter. 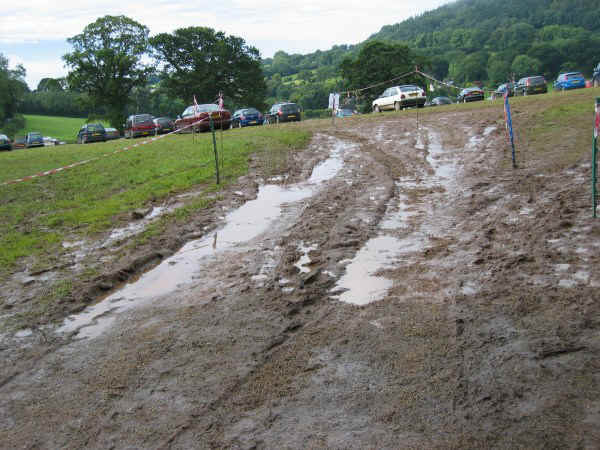 The cheery 'festival car park' signs said nothing about wellington boots, ruts in the access lane deep enough to remove exhaust pipes, suitability for disabled drivers or the possible effects on those of a nervous disposition. The entrance route was changed as areas of ground became impassable. Early on, stewards stopped cars on ground like this and were then surprised they needed pushing to get going again. They soon learnt! Extract from the festival brochure. This should warn about wet weather conditions and that the Bulverton car park may be unsuitable for some disabled people. Wellington boots were pretty much essential - any innocent day visitors who used this car park must have gone home vowing never to come again! The mudslide out of the Bulverton car park. One nervous woman asked me if this was the only way out. When I told her how careful she needed to be she looked even more worried. A few drivers tried their skid pan skills - and nearly went through the hedge. A late night reveller tried handbrake turns. All such behaviour merely churned up the ground and pushed more mud down the slope. Large warning signs might have helped - although most people were being cautious, maybe having remembered previous years. Turn sharp left to exit - but this was only possible if your car was obeying its front wheels. Large areas of temporary roadway would have helped but would have been expensive. It is to be hoped the contract for hire of the field did not stipulate it should be returned to the farmer in the condition in which it been found. The worst of the mud was somehow removed from the exit late in the week. Maybe it was sold in small souvenir jars? "I overheard a steward saying that the equipment to lay temporary roadways was available but the festival had decided not to spend the money." The festival actually tried very hard to source the necessary additional trackway, but because the weather conditions were affecting events all over the south of the country, it was in very short supply and we were unable to do so. There are already plans in place to source extra trackway now in order to have it on standby for next year. 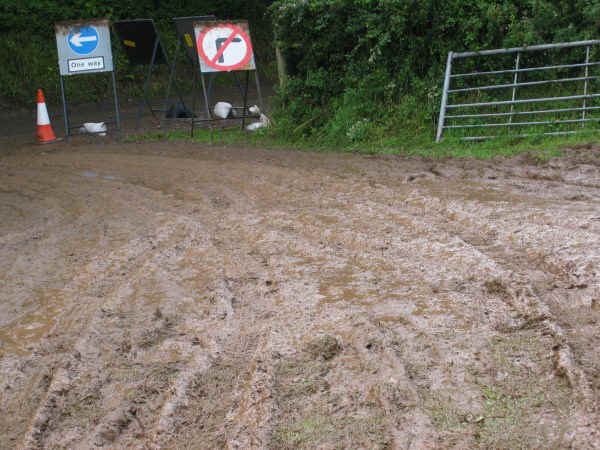 Under the all-pervading provisions of the Law of Sod, spending money on extra trackway should ensure that it will not be needed - so look forward to good weather in 2010! 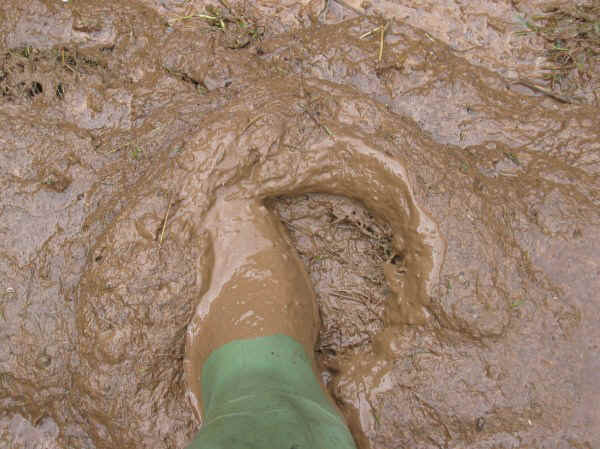 Sidmouth is not alone in having problems with mud - here are a few amusing photographs from Bromyard Folk Festival in 2008. The page was created primarily to entertain a couple of friends (rather than for publication) and should be read in that light. But does it need to be like this every year it rains? On fields that it is known (or postulated) may be used for a decade, the costs of providing semi-permanent roadways might compare with the costs in time and money of providing often inadequate temporary solutions every or most years. This could be evaluated for the most critical areas. This exit route was the least important of many areas used by the festival. Provided you were sensible, there was really little problem. One reason it was so muddy is shown here!